Floating social bar is the best social media plugin for WordPress that allows you to maximize your social media visibility without impacting your site speed. If you are looking for a social media plugin for WordPress, then you don’t need to look any further. Floating social bar adds a horizontal share bar on your blog posts, and pages. The floating technique positively reinforces your users to share your content which results in an increase of social media shares. Best Social Media Plugin for WordPress? Unlike other social media plugins for WordPress, we like to keep things simple and fast. There is no point in adding social media buttons for all different type of networks. This is why we only offer share buttons for Twitter, Facebook, Google+ Pinterest, and LinkedIn. Floating Social Bar only loads scripts when necessary. None of the social media scripts are loaded on the initial page load. Instead we show a replica image with all the share counts. We use socialite technique to only load social scripts when the user brings their mouse over the button. Doing this allows us to keep your site just as fast as it would load without any social plugins. Yes, this means that this plugin is faster and better than Jetpack Social plugin, DiggDigg, and basically any other social media plugin for WordPress. It is even faster than you trying to paste social buttons directly within your WordPress theme. First thing you need to do is install and activate Floating Social Bar plugin from your WordPress admin. 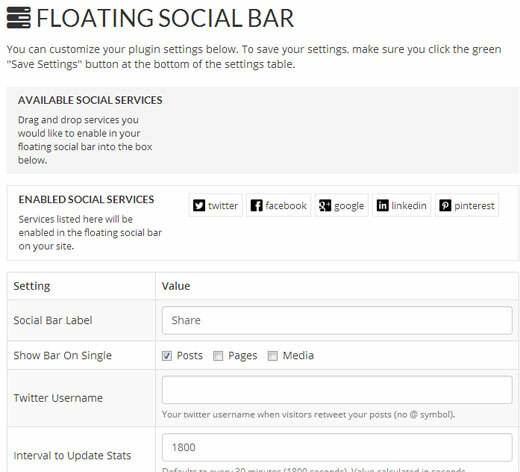 Upon activation, the plugin will add a new menu under Settings » Floating Social Bar. To add the floating social share bar to your blog posts, simply drag and drop the available social buttons in the enabled social services area in the order you would like to display them. Next, add your twitter ID in the field in the following format wpbeginner. The title for the share bar will only show up if there is enough space for it. If you use all sharing buttons, then chances are that you can’t get the title due to width constraints. You can choose the post types you want to add the floating social share bar such as posts, pages, or any other custom post type. The cache interval field is what allows this plugin to be the most efficient. We recommend that you don’t change this number unless you know what you are doing. Here is how it works. By default, this plugin gets the social media count from the APIs and store it in a cache for 30 minutes. It only gets the count for the post when its loaded to reduce server load. For example, if no one visits your two year old post, then this plugin will not waste your precious server resources for that post. It only gets the count right when a user visits the post or page. There are other fields to make the bar static if you don’t want it to float. You can choose to position it above the content, below the content, or both. Simply check the box to make the bar static. The checkbox to disable socialite basically stops the flickering that some users don’t want. Note, this will not load any scripts and open the share box in new window. That’s it. Now when you go to your post page, there will be a horizontal floating share bar. Before asking for support, please read through the frequently asked questions about our Floating Social Bar plugin. Why is there no count on my button? Due to a lot of requests, we decided to hide the count if it is 0. The count will only appear if it is 1 or higher. Is there a template tag for this plugin? We have extensively tested this plugin on various browsers and server environments. However it is impossible to test for every use case. If you do run into a problem, then please use the WordPress.org Support Forums. We will do our best to help you out. Please read this article on how to properly ask for support and get it. Floating social bar is a light-weight WordPress plugin that adds a horizontal floating share bar on your blog posts, pages, and other post types. The floating ability allows this eye-catching bar to get you maximum shares. This floating ability positively reinforces your users to share which results in increase in social media shares.